If you are the owner of a large dog, you are probably familiar with the term “hip dysplasia.” Hip dysplasia is a serious skeletal disorder common among large and giant dog breeds, but which can also affect medium dogs. Generally, this disease is caused by genetics and environmental factors, and is characterized by a malformation and misalignment of the hips — more specifically, the hip joint (coxofemoral joint). The coxofemoral joint, which should fit tightly together in healthy hips, develops with a degree of looseness. Rather than moving smoothly, the ball and socket that make up the joint rub and grind, leading to deterioration of the bone and joint structures in the hips. This causes inflammation, decreased range of motion, and reduced or loss of function that cause your dog pain and discomfort. This is a very scary condition, as it can limit a dog’s ability to play, exercise, and move, while reducing their overall quality of life. 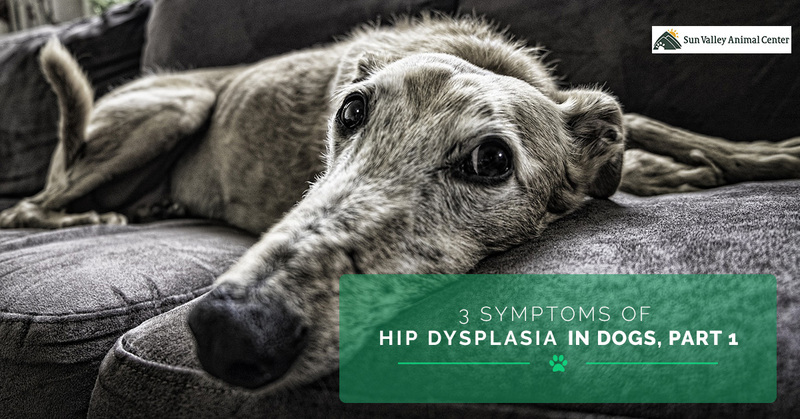 Understanding the symptoms of hip dysplasia can help large breed puppy and dog owners take the necessary steps to keep their furry friend active, healthy, and happy. Today, we will look at three common symptoms of hip dysplasia in dogs that owners of large breeds should be aware of. If you think your dog may have this condition and you would like to consult with a pet surgery specialist, contact the Sun Valley Animal Center team to learn about non-surgical treatment options and if your dog may be a candidate for a total hip replacement. Please continue reading below. Hip dysplasia may appear in some dogs as young as four months while symptoms may occur in other dogs over time with age. Identifying the symptoms can lead to early intervention and pain management that can reduce the need for a hip replacement later on. One of the first signs dog parents notice is that their normally active dog is much more tired, subdued, and less enthusiastic about physical activities. If your dog seems to have less energy, sleeps more, is uninterested in playing or going on walks, call your veterinarian. This may be a sign that they are in pain and discomfort, rather than simply feeling the effects of aging. If your pup is slow to rise from a lying position, this may be a sign of joint stiffness. Inflammation in the joints, and reduced or no cushioning within the joint capsule, can limit their flexibility and movement, making simple actions such as standing a difficult task. While this may seem like a cute and silly behavior, a “bunny hopping” gait typically occurs when dogs have pain and limited range of motion in their hips. A bunny hop is characterized by the simultaneous movement of their hind legs to propel themselves forward when walking, running, and especially when going up and down stairs. If your large breed canine companion displays these symptoms, you will want to talk with your vet to explore preventative measures and non-surgical treatment options first. Your vet can examine your dog and diagnose their condition, and if they feel a hip replacement is indicated, they can explore corrective surgery options with you. Give our nationally-renowned pet surgery specialists at Sun Valley Animal Center a call today to schedule a hip dysplasia consultation for your dog.